Here are some of my Vst plugins offered free to the visitors of this site. If you find one of them useful please consider donating a small fee (€ 5.00 or multiple) to support future development. Donators are entitled to MidiKarval's full support for these free plugins. With Channel Changer you can change the transmitting midi channel of your keyboard on the fly, simply pressing a button and a key. Open it in your VST host application, connect the host midi input to the Channel Changer's midi input and its midi output to the midi input of a Vst instrument. Set your midi keyboard's transmitting channel to channel 1, press and hold a button of your midi keyboard sending a CC message #105, set the desired transmitting channel pressing a key in the range C4 (channel 1) - D#5 (channel 16) then release the button: the chosen midi channel is shown in the Channel Changer's GUI. In order to come back to midi channel 1 (reset) simply press a button of your midi keyboard sending a CC message #106. 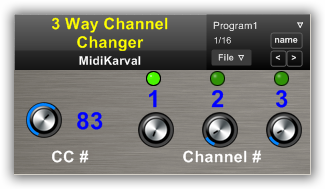 You can change the CC messages to be used for changing midi channel and resetting to channel 1 through the relevant drop list in the Channel Changer's GUI. With MidiTransposer you can transpose your keyboard on the fly, simply pressing a button and a key. Open it in your VST host application, connect the host midi input to the MidiTransposer's midi input and its midi output to the midi input of a Vst instrument. Press and hold a button of your midi keyboard sending a CC message #110, set the desired transpose interval with reference to the C4 key (midi note number 60) pressing the corresponding (upper or lower) key, then release the button: the chosen transpose interval is shown in the MidiTransposer's GUI in terms of upper or lower (-) semitones. In order to cancel the transposition (reset) simply press a button of your midi keyboard sending a CC message #111. You can change the CC messages to be used for transposing and resetting the transposition through the relevant drop list in the MidiTransposer's GUI. - the XK-3 drawbars send out only three CC message numbers: #80 for all the upper drawbars, #81 for all the lower drawbars and #82 for the two pedal drawbars. "Drawbars Mapper for XK-3" solves this problem and allows you to enjoy your XK-3's manuals and drawbars playing those superb Hammond clones. Simply open it in your VST host application (we recommend EnergyXT or Hermann Seib's VSTHost), connect the host midi input to the "Drawbars Mapper for XK-3" 's midi input and its midi output to the midi input of the plug-in organ. The 4 leds indicate which plug-in's drawbars set is moved or if other midi messages (notes, other CCs, etc.) are sent to the plug-in. Channels Mapper is a midi processor that redirects each input midi channel to every other midi channels. You can choose both the input midi channel (via the knobs) and the relevant output channel (via the sliders) with the maximum flexibility. The "reset" button alternatively set all input channels and output channels to 1 or each of the 16 input channels to the correspondent output channels. You can save different setting via the file box on the bottom right of the Vst plugin. each input has a led flashing when a midi message on the relevant midi channel is received. 3 Way Channel Changer allows to change the transmitting midi channel of your master keyboard on the fly, simply turning the knob (or slider) assigned to the CC message chosen using the "CC #" knob: when it is in the "0" position the transmitting channel is the first indicated above "Channel #", when in the middle position ("64") is the second, and when in the end position ("127") is the third; a led show the transmitting channel in use. All the four knobs can be turn from the VST panel or using the parameters assignment in your host.